Doug Lucente, the last of nine children of John and Sondra Lucente, was raised in Lexington and is a proud product of the Lexington Public School system. As a teenager Doug was involved in many volunteer activities with the town and church. He was awarded the Outstanding Youth of the Year Award in recognition of his efforts throughout high school. He went on to graduate from American University in Washington DC, where he had the unique opportunity to serve as a White House Intern. He then worked for the Central Intelligence Agency (CIA) throughout college to help pay for his education, an experience that helped Doug foster his leadership and listening skills. In 1996, Doug moved back to Lexington to attend Law School at Suffolk University launching his legal and professional career in the field of healthcare finance. Doug has worked extensively as a volunteer to help create and sustain projects and events that bring the entire community together. Doug has served as an elected Town Meeting Member for 14 years and understands how our town government works. For 28 years, he has been involved with the Lexington Youth Commission, an organization dedicated to encouraging our youth to give back to the local community through volunteer activities. As past president of the Lexington Lions Club and Treasurer for 12 years, Doug has led the organizing of the Annual 4th of July Carnival and Patriots’ Day Road Race. He was instrumental in the establishment of the Lincoln Park restroom facility, and recently the Fletcher Park Community Ice Rink. Additionally, his work with the Lincoln Park Sub-Committee, demonstrates his commitment to our local green space. Doug is committed to bringing all members of our diverse community together. Simply stated, he gets it done. As an attorney and successful CEO of his Lexington-based business currently in it's 21st year, Doug is fully invested in our community. His business, which has grown significantly over the past decade employs over 60 people based out of Lexington. Doug chose to invest in Lexington's commercial real estate market as part of his deep commitment to the town. His experience includes legal aspects of healthcare finance, commercial real estate renovations, and building a startup into a flourishing business. Doug and his wife, Kristin, have two daughters Madelyn and Ella who both attend Jonas Clarke Middle School. Kristin is a Kindergarten Teacher Assistant for Lexington Public Schools. They also are proud owners of a three year-old dog, Bailey. 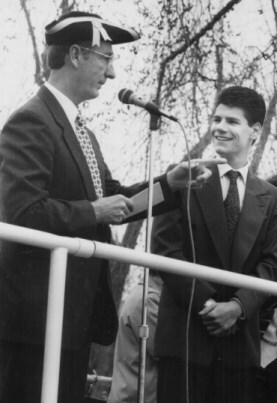 Doug has always believed that when we work TOGETHER to do what's best for the community, we get the best results. 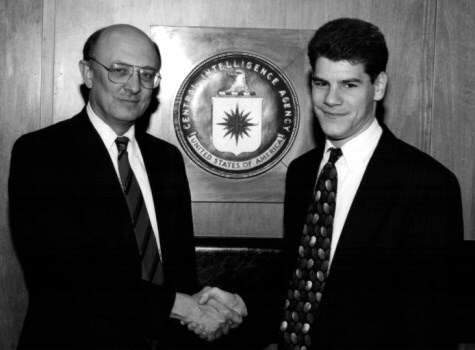 Shown Right: Doug with the CIA Director, James Wolsey, in 1994.